This product range is manufactured with a prebond of non woven web by employing either Rando technology or a traditional carding machine. Phenolic and acrylic resins, as well as different types of minerals, such as alluminum oxide, silicon carbide, quartz and others are used. 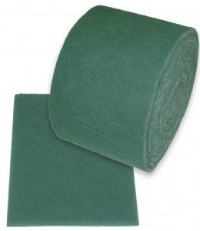 Hand pads and rolls of high quality abrasive fibre, with enhanced resistance suitable to clean non-delicate surfaces. Dark green colour. 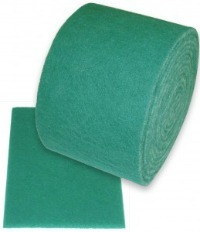 Hand pads and rolls of standard quality abrasive fibre, suitable to clean non-delicate surfaces. Light green colour. 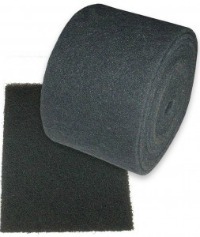 Hand pads and rolls of no scratch abrasive fibre, suitable to clean delicate surfaces. White colour. 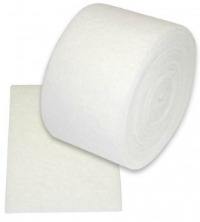 Hand pads and rolls of extra aggressive fibre, suitable fo remove stubborn dirt on non-delicate surfaces, like grill grates. Black colour.